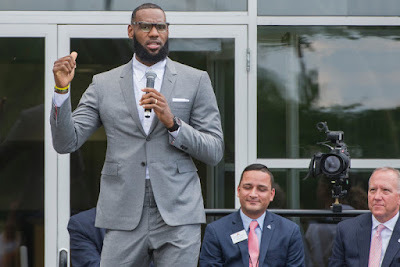 LeBron James speaking at the opening ceremony for the I Promise School in Akron, Ohio, which is a partnership between his philanthropic foundation and the city’s public schools to serve at-risk children. President Trump took aim at Mr. James and Don Lemon, the CNN anchor, on Twitter. President Trump lashed out at the basketball star LeBron James in a scathing attack on Twitter on Friday night after Mr. James criticized the president in an interview on CNN. In a wide-ranging interview with Don Lemon, an anchor on CNN, Mr. James spoke about a school for at-risk children that he recently helped open in his hometown, Akron, Ohio, in a partnership between his philanthropic foundation and the city’s public schools. During the interview on Monday, he also said Mr. Trump was using sports to divide the country. The interview was aired again on Friday night, and Mr. Trump responded on Twitter shortly after, insulting Mr. James’s intelligence and that of Mr. Lemon. The reference to “Mike” appeared to be Mr. Trump’s way of taking sides in the debate over who is the greatest basketball player of all time: Mr. James or Michael Jordan.